Before we left Carmel to embark upon our epic cross-country road trip, we headed a few miles south down the coast to have lunch at Rocky Point Restaurant. 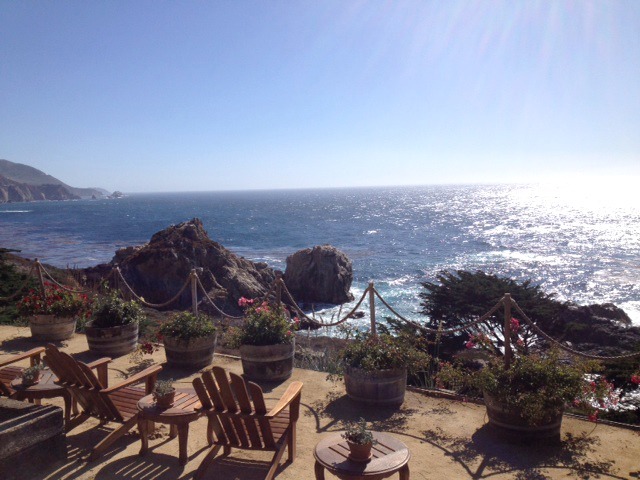 Located between Carmel and Big Sur, Rocky Point boasts one of the most incredible views I have ever seen. Perched right at the edge of the cliff, the restaurant has an outdoor seating area with spectacular panoramic views of the rugged coastline and Pacific. While the views were spectacular, what we really came for was...the cheeseburger! For those of you who know my Godmother, Libby, it shouldn't come as much surprise that she has managed to root out the best burger in the area--she is a connoisseur. Needless to say, when she says order the burger, even in a place renowned for it's seafood, I order the burger. I wish that I had a pic to share with you all, but when our plates arrived we were too busy getting stuck in to even think about taking pics! A perfectly cooked grass-fed beef patty, smothered in onions, monterey jack, roasted garlic aioli, and fresh avocado slices---it was just as good as it sounds. We washed our burgers down with ice-cold Arnold Palmers and crispy fries-- I am getting a bit hungry just thinking about it! Our meal, in combination with the view, sea breeze, and the company of two of my favorite people made for such a lovely afternoon that I will not soon forget. If you are in the Carmel/Monterey area, or planning on visiting, than you must add Rocky Point to your list of places to hit while you are there. Lunchtime was great, and not too busy--definitely try to sit outside if the weather is nice. I imagine that the night-time ambiance is also wonderful, especially during the evening when you could watch the sun set over the Pacific. Also, while I can only vouch for the burger, I wouldn't be surprised if the rest of their menu was just as delicious. If I were you, though, I would definitely go for the 'burger with a view'...just saying. More about our road trip coming up tomorrow! P.S. Like what you are reading? Go ahead and subscribe by entering your email address into the form on the left-hand side of this page so that you never miss a post! Or, you can follow me on Bloglovin. Also, feel free to check out my instagram and pinterest.